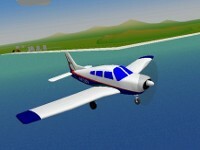 YS Flight Simulator is lightweight airplane simulation game for everyone. However, with full package of basic flight functionality, YS Flight Simulator is a great way to feel how to fly various airplanes in every condition, whether it is on aircombat or just a general flight practice. Although many gamers tend to play only for fun, there are lots of people that think of computer gaming as an extension of their passion, and the flight simulators are a prime example of this. YS Flight Simulator is a game that is created specifically for the plane enthusiasts and which allows you to engage in realistic, action packed battles against a plethora of enemies. What makes YS Flight Simulator stand out is the fact that unlike other similar game, the title focuses mainly on flight realism, and it brings a lot of great functionalities. In fact, YS Flight Simulator comes with full networking support, which makes it a great option if you have a bunch of friends that enjoy flight simulation games as much as you do. A lot of detail went into the creation of each aircraft, especially if you take into consideration the fact that this game has been created by a single person. There are lots of aircraft types that you can control in YS Flight Simulator, each one depicting real life models that are great looking and quite appealing as well. But the heart and soul of YS Flight Simulator is definitely the gameplay on its own. No matter if you engage into battles against the AI or your friends, you will be able to create formations and become their leader, attack in the air and perform dogfights or even perform ground attacks if that is what you want. YS Flight Simulator is all about giving you the freedom of choice in regards to what you do and how you do it, and that is why you aren't limited at all in regards to what you do. And since the game is a simulator, the sheer joy of taking off and landing on a carrier is more than enough to make your day as you play the game. On top of that, YS Flight Simulator comes with more than 50 different airplanes, not to mention that there are numerous maps as well, which makes the whole experience a lot more interesting and appealing to say the least. What's very interesting about YS Flight Simulator is the fact that the game comes with a wide range of animations that just bring an extraordinary feeling of authenticity to the game. And even though the title might not be the most realistic simulation game on the planet, it does have a fair degree of customizable controls. All in all, YS Flight Simulator is a very interesting, customizable and very fun flight simulation experience that will allow you to explore the surroundings like never before. With network play and lots of interesting features, YS Flight Simulator successfully manages to stand out and provide a unique flight experience like never before. It's well worth giving it a shot, as long as you are willing to go past some minor mistakes. Take control of a fighter plane quickly and safely in order to defeat all opposing aircraft.